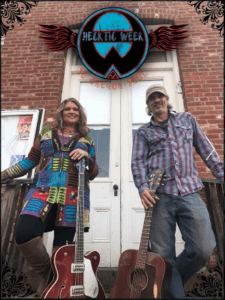 Hecktic Week returns to Yachats Underground Pub & Grub Saturday April 13, 2019. Hecktic Week is an “energy packed duo” with powerful vocals and beat driven grooves! 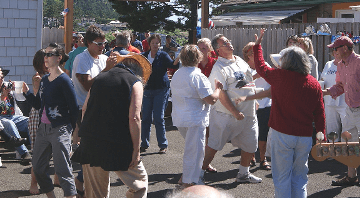 This will be their second appearance at Yachats Underground. 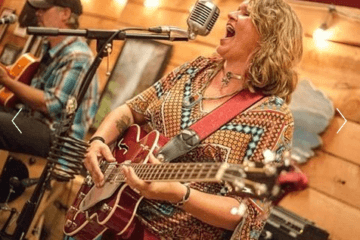 Their “foot stomping” and “soul touching” sound is a blues influenced infusion of nostalgic country, folk, and rock! Gypsy (Jennifer Weekly) grooves on her bass guitar while filling the atmosphere with a power house voice reminiscent of Janis Joplin. Heck (Michael Hecker) is a “one man band” playing guitar, harmonica, and drums. Together, they bring the sound of a big band in a small package.